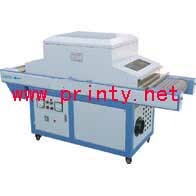 Professionally manufacture wholesale and supply standard UV curing machine. China UV curing machine manufacturers supply all kinds of UV curing machine,UV cure equipments,flat UV curing machine,UV conveyor dryer tunnel. Custom built and World wide supply high quality non standard UV curing machine,UV curing equipment,UV cure machines equipments,UV dryer,UV drying tunnel,UV curing oven for special products drying requirement.